The baked version has been put on the back burner – for another day and time. So sorry healthy my healthy peeps. 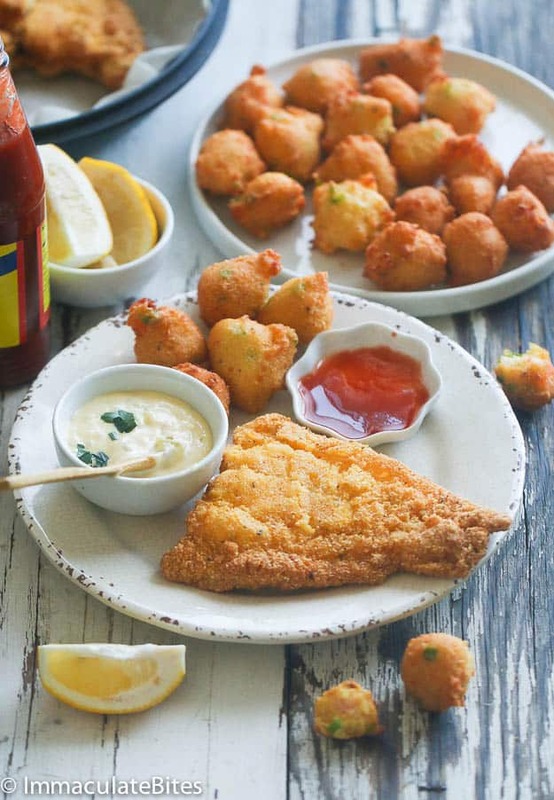 Although not the healthiest choice, deep frying fish adds great flavor and wonderful crispiness to any fish. When done right it can’t be beat. 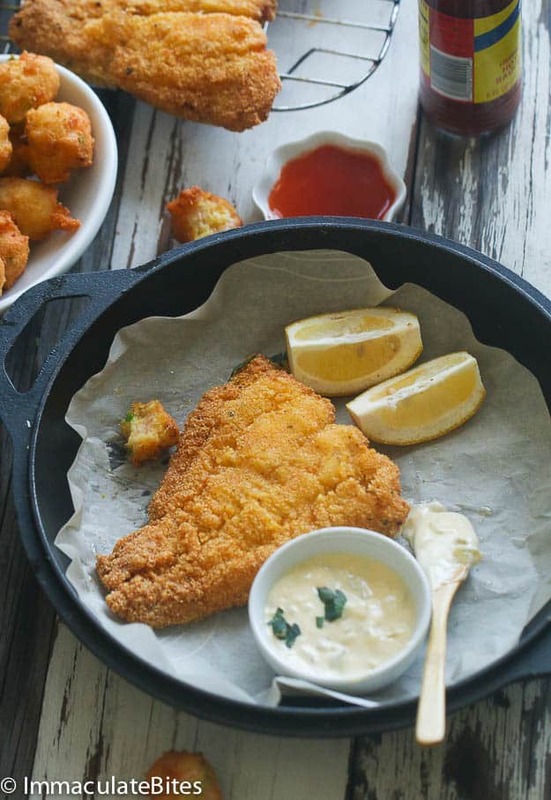 This Southern Fried Cat Fish is one of my favorite ways of frying fish. I remember living next to a local seafood market and would never get tried of ordering fried fish. Yep! I ate my way through the menu- from fried fish to calamaris. Those days are long gone, Now, I have to balance out my meals. Am not a young chicken anymore. But I have to go there occasionally . It’s pretty had for me to completely give up a meal I really enjoy. 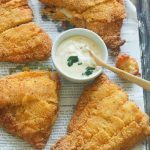 This recipe is made with the very minimal ingredients, the Cat fish fillets are dipped in buttermilk and coated with a seasoned corned meal – with granulated garlic, onion powder, cracked pepper, cayenne pepper and salt. This is gluten free – no added flour. I find the cornmeal adds a gritty crunch to the fish. Which adds to it’s appeal. Don’t care too much for cat fish , then replace it with another white fish ; tilapia, red snapper it works just as well . Also you can cut in strips or bite size portions if desired . 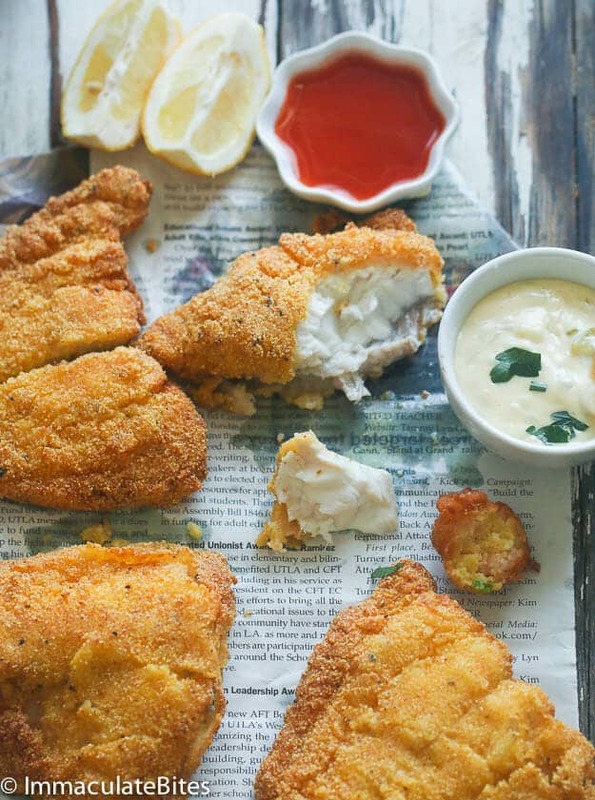 Serve with it homemade tartar sauce here or store bought version. For the best possible results, start by making sure that your fish is absolutely fresh. A fresh fish should smell like clean water. Do not buy fish that has fishy odor. Cooking won’t improve it. Speaking from experience here. 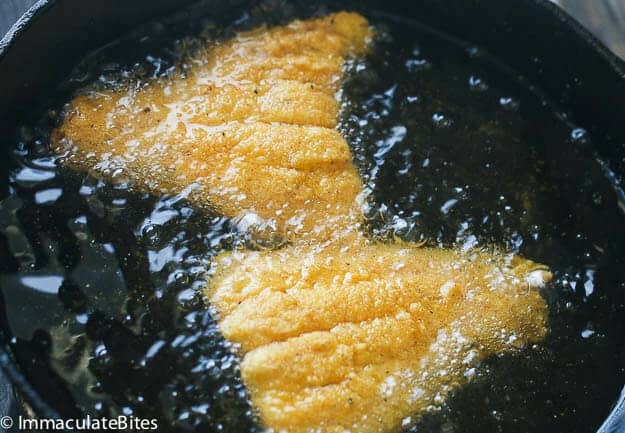 Overcrowding your cast iron or deep- fryer will lower the oil’s temperature, which can result in soggy fish. So stick with a few pieces at a time. Before frying the temperature should be around 375 degrees it ensures that the batter reacts and creates a barrier between the oil and the food. If your oil’s temperature it too low, the food will soak up oil. Why does it say cook time is 58 minutes, but when reading the instructions it says 3-4 minutes per slice? I have updated recipe. The cooking time varies – 3-6 minutes per side depending on the size of the fish. Thanks for bringing this to my attention. 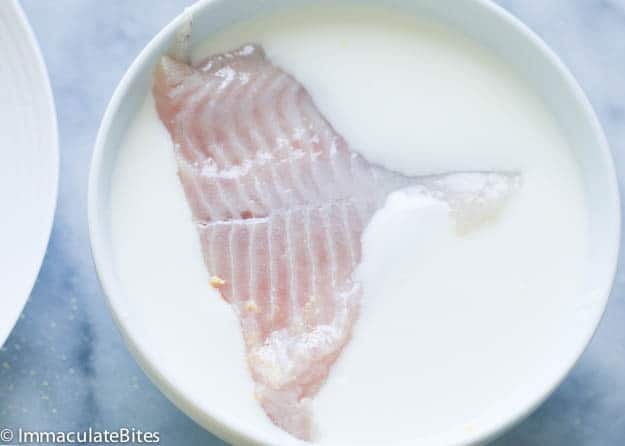 What are your thoughts on marinating the fish in milk or 1/2 milk and 1/2 buttermilk overnight. Some people do ya know. Does this recipe contain a lot of Heat? 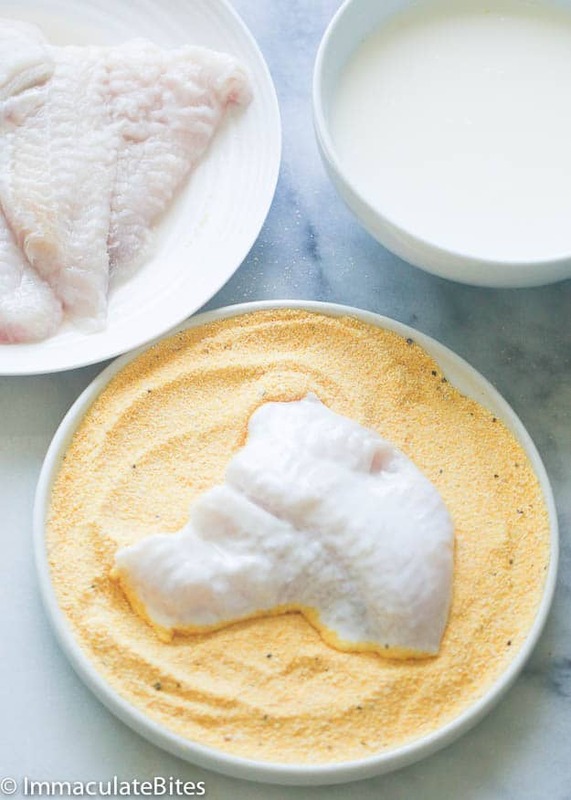 What kind of cornmeal is best to use when frying the catfish? I use regular cornmeal , available in most supermarkets. 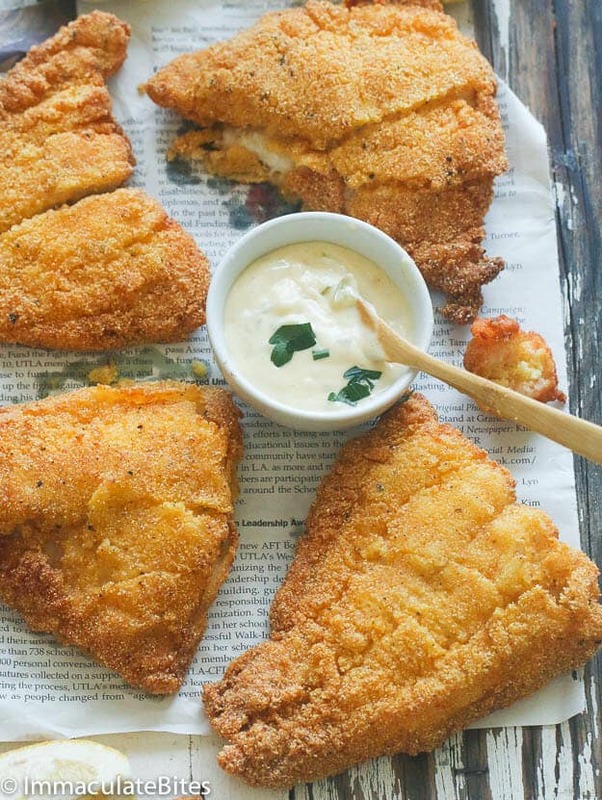 Love your catfish recipe! It’s the best! Thanks so much! Thank you so much ! So happy to hear it worked out well for you. 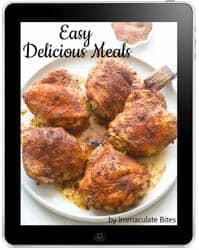 Yummy recipe ImmaculateBites. As soon as i get myself a fillet knife i will cook it up. Really excited. Amazing recipe. Thanks for posting, I’ll never use another one. Yaaay! Thank you so much! My grandmother really loves fried catfish. I want to learn how to make it for her. It is good to know that I should coat the fish in cornmeal. I might want to ask a restaurant that makes fired catfish how to fry it well. I’ve never tried to fry fish. Living in Mississippi, there are catfish restaurants all around. However, my husband was in Florida recently and caught a some fish he wanted to fry. This recipe was excellent, even though none of the fish were catfish. It’s in my recipe box now. Thanks! I made this just now with Bob’s Red Mill gluten free corn meal and it came out perfect! I fried the fish in a cast iron skillet to use less oil and doubled the garlic, but otherwise followed the recipe exactly. So crunchy and yummy!! 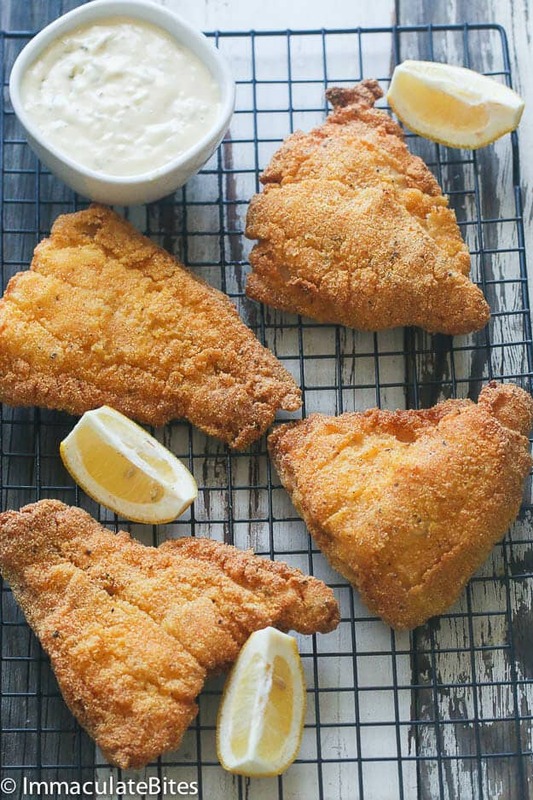 So I’m googling various fried fish recipes and I stumble upon this one, which is arguably the best I’ve seen. I click the about me page since, well, I must know who I am learning from, only to find out it is MY VERY OWN AUNTY IMMA! I love you so much aunty and I will definitely let you know how this recipe works out! OMG! Khadijah? So happy to hear from you, my Sweet Niece. We need to talk. I hear graduation is coming up… SO EXCITED for you. Can’t believe you are going to be a College Graduate- Damn, am getting old! You know, you can make fish tacos out of that fried catfish! Yum! Yes , you sure can. The hot pepper relish, is there a receipt for that? Or where do you buy it? Check it out at Walmart. Or replace with pickled relish- readily available in most Supermarkets. Totally giving this a try tonight for dinner with my Boyfriend! Fingers and toes crossed lol I’m hoping for a great outcome, I’ll certainly post back with my conclusion! Thank you so much for sharing this! No worries you are going to NAIL it ! Can’t wait for your feedback. Happy Cooking !!! Wow, that Cat fish recipe is really mouth watering, but i have one question that i have recently read somewhere online that cat fish can cause brain related illness, is it true? Hi Melissa! Sorry to say am not an expert on that subject. So don’t have much advice here. You recipes look awesome and delicious. Thanks Praveen ! Have you check this other recipes here https://www.africanbites.com/slow-cooker-jamaican-curry-chicken/ and this here https://www.africanbites.com/curried-goat-stew/. Easily adaptable to suit fish and chicken. Do I have to use milk could I just mix in the cornflower and fry it?? The corn meal would not adhere to the fish that much resulting in very little coating for the fish. If you must then cornflour would be slightly better. I use half flor and half cornmeal . It adheres well and u can skip the mill. Very crispy! We caught a 3 lb catfish last nite. Our first, my eight year old daughter reeled it in. We soaked it overnight in buttermilk and fried as above. Wonderful!!! Three pound cat fish? Wow! That’s huge. That must have been some experience for your daughter. Pleased to hear it worked out well for you Marijeanne. Thanks for the feedback! Your catfish looks delicious. 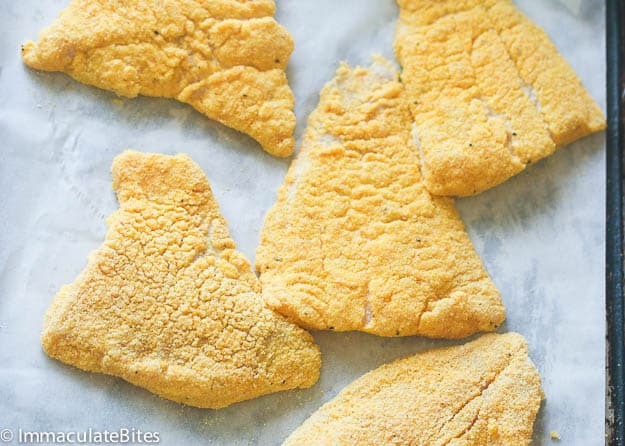 I’ve been searching for a good cornmeal coated catfish so I gotta try this one. Should I use fine or coarse cornmeal? Than for your response. Hi Taysha! I use the regular store brand – from walmart, or your local supermarket. Have tried different variety and they all do just fine. Omg omg omg, the best fried fish ever. Ty for posting this recipe! By the way I cooked swai fish instead of catfish, it’s a cleaner tasting than catfish to me. Wow! I’m happy to hear you enjoyed it Jess, thanks for letting me know! Saw is a good alternative too! All of your recipes are awesome! Imma, yours is one if the best and most enjoyable food blogs I’ve come across on the internet in a long, long time. I’ve become addicted to your recipes and ideas. I had some good friends from Jamaica and shared great times (meals, etc) together in Papua New Guinea years ago. You’ve sparked so many great memories for me. It’s going to be cruel if you stop uploading. Thanks so much. Aww thank you so much! Michael, just made my day!!!! You’ve given me one more reason to keep it going even when my body tells me to take a break. Happy Cooking! Never had a cat fish, it looks yummy prepared your way! Nice to see some one presenting something from Africa,keep yup good job. Thanks mwebelha, let me know which recipes you make.